Digital dental X-rays are an important diagnostic tool. 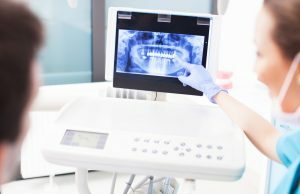 Uncovering hidden decay, damage to existing restorations and other oral health issues, these modern radiographs release only minute amounts of radiation for better patient safety. Learn why the team at Mt. Holly Family dentistry uses digital X-rays for all their patients. The types of views include panoramic (the entire mouth), bite wing (posterior teeth), periapical (for a good look at a tooth from root to crown) and occlusal (showing how teeth in one arch bite with the teeth in the opposing arch). Your dentist determines which views he or she needs and when to take them. The Food and Drug Administration developed clear guidelines for use of dental X-rays back in the 1980s. In general, child need more frequent imaging because their teeth and jaws are still developing. Plus, people with compromised oral health require more X-rays to check treatment progress and development of additional problems. Even though digital dental X-rays are deemed safer, pregnant or lactating women should postpone imaging for elective dental procedures. Digital X-rays are one of many tools the team at Mt. Holly Family Dentistry uses to stay on top of your oral health. Partnering with your hygiene habits at home, X-rays, cleanings and visual exams by our expert doctors and hygienists help optimize your dental and gum health. For your routine appointment, contact Mt. Holly Family Dentistry today.